BEIJING/SINGAPORE (Reuters) - Chinese buyers of Iranian oil are starting to shift their cargoes to vessels owned by National Iranian Tanker Co (NITC) for nearly all of their imports to keep supply flowing amid the re-imposition of economic sanctions by the United States. The shift demonstrates that China, Iran's biggest oil customer, wants to keep buying Iranian crude despite the sanctions, which were put back after the United States withdrew in May from a 2015 agreement to halt Iran's nuclear programme. The first round of sanctions, which included rules cutting off Iran and any businesses that trade with the country from the U.S. financial system, went into effect on Aug. 7. 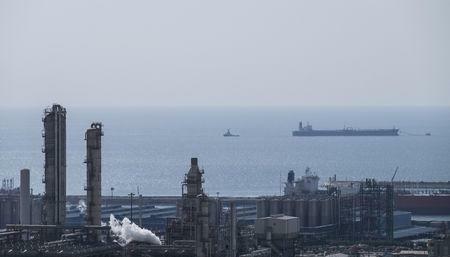 A ban on Iranian oil purchases will start in November. Insurers, which are mainly U.S. or European based, have already begun winding down their Iranian business to comply with the sanctions. To safeguard their supplies, state oil trader Zhuhai Zhenrong Corp and Sinopec Group, Asia's biggest refiner, have activated a clause in its long-term supply agreements with National Iranian Oil Corp (NIOC) that allows them to use NITC-operated tankers, according to four sources with direct knowledge of the matter. They spoke on condition of anonymity as they were not allowed to speak publicly about commercial deals. The price for the oil under the long-term deals has been changed to a delivered ex-ship basis from the previous free-on-board terms, meaning that Iran will cover all the costs and risks of delivering the crude as well as handling the insurance, the sources said. "The shift started very recently, and it was almost a simultaneous call from both sides," said one of the sources, a senior Beijing-based oil executive. In July, all 17 tankers chartered to carry oil from Iran to China are operated by NITC, according to shipping data on Thomson Reuters Eikon. In June, eight of 19 vessels chartered were Chinese operated. Sinopec declined to comment on the change in tankers. A spokesperson with Nam Kwong Group, the parent of Zhenrong, declined to comment. Iran used a similar system between 2012 and 2016 to circumvent Western-led sanctions which were effective in curtailing exports because of a lack of insurance for the shipments. "This is not the first time companies exercised the option... Whenever there is a need the buyers can use that," said another of the sources, also a senior Beijing-based oil executive. Term buyers of Iranian submitted their plans to NIOC earlier this month of how much crude they will lift in September, said two trade sources. It typically takes about a month for Iranian crude to reach China. With the new shipping arrangement, Iranian oil cargoes to China are expected to stay at recent levels through October, said the four sources with knowledge of the tanker changes.